Spring is in the air! Green grass is growing, temperatures are warming up and some of you are considering doggy day care for your favorite canine. I personally love the idea of doggy day care. I started Sheba’s in 2004 and have the privilege of seeing so many great dogs flourish in the day care environment; big dogs, little dogs, young pups and silver seniors. Dogs in day care enjoy hours of structured off leash play, socialize with a variety of dogs, and get a chance to romp and run with friends instead of laying around all day at home or alone while owners are gone. Day care can also reduce separation anxiety, reduce the risk of chewed furniture and shoes and offers a positive outlet for your four-legged friend. But is your Fido a good candidate for doggy day care? Before touring day cares take a moment to consider your dog’s personality and experiences. How old is your dog? Sometimes age does matter. Is your dog older and new to the off leash scene? Is your dog considered senior and have physical limitations like poor eye sight or hearing? Arthritis or hip dysplasia? Your dog may be social but very guarded because of physical limitations and may get overwhelmed in the midst of many rambunctious dogs. Has he or she ever been off leash with another dog or group of dogs? Any doggy day care experience? Any concerns? Has your dog ever been to a dog park? How was the experience? Does he or she get along well with others or is your dog considered the bully of the park? Any mounting? Has your dog ever shown aggression towards other dogs or people? Does your dog resource guard: toys, foods, water bowl, anything else? Be ready to answer the above questions and more when filling out an application at a doggy day care center. And yes, any reputable doggy day camp should ask similar personality questions before entry into their program. At Sheba’s, we ask the above questions, require a new camper application, an on-site visit for an owner orientation, and the camper to successfully pass a temperament test with one of our experienced, non-reactive campers – aka Welcome Waggins’. After passing our temperament test, we slowly introduce new campers to friends with similar play styles in one-on-one Meet & Greets. If all goes well and there are no concerns, we release your camper into a group of 15 or less (our staff ratio is 1:12) to enjoy hours of off leash fun, interact with new and old friends, learn basic doggy manners, and etiquette. For those dogs that do not pass our temperament test, we always share with the owners the reason for non-admittance. It is always a tough but necessary conversation. Because the reality is that some dogs enjoy people more than interacting with other dogs, some dogs are overwhelmed by the group off leash experience, and other dogs do best with one-on-one activities. 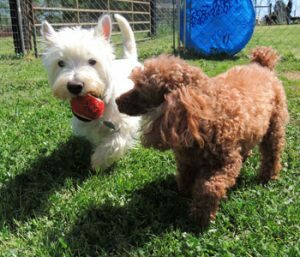 Doggy day care is a great option for social dogs who love the company of other dogs and need minimal correction. 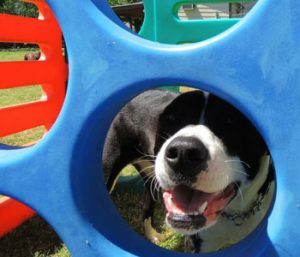 A doggy day care’s main focus is to provide a place for dogs to meet friends, enjoy off leash fun, and for younger dogs to learn social skills. It is not a place for remedial socialization or behavior modification unless a separate program is offered. Interested in scheduling a new client orientation at Sheba’s Doggy Camp? We would love to meet with you and your camper. Contact us at 704-777-1333 or by email!